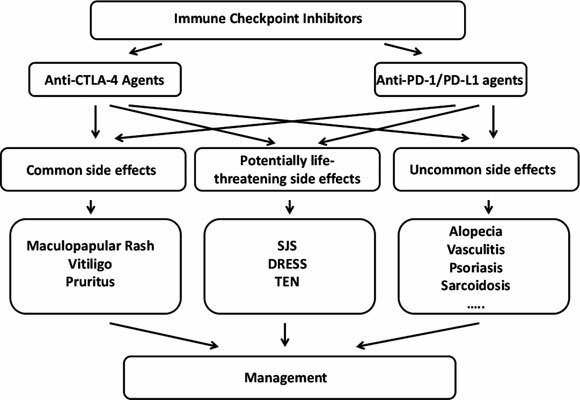 Keywords: Cutaneous adverse reactions, immune checkpoint inhibitors, management, melanoma, skin toxicity, therapy. Keywords:Cutaneous adverse reactions, immune checkpoint inhibitors, management, melanoma, skin toxicity, therapy. Abstract:Background: The introduction of Immune Checkpoint Inhibitors in the recent years has resulted in high response rates and extended survival in patients with metastatic/advanced malignancies. Their mechanism of action is the indirect activation of cytotoxic T-cells through the blockade of inhibitory receptors of immunomodulatory pathways, such as cytotoxic T-lymphocyte-associated antigen-4 (CTLA-4), programmed cell death protein-1 (PD-1) and its ligand (PD-L1). Despite their impressive therapeutic results, they can also induce immune-related toxicity, affecting various organs, including the skin.